The following article was written by Ann James and Luke Clements. It appears on their superbly informative website which can be viewed here. We would like to thank Ann and Luke for their research and work in putting together such a comprehensive report. Independent Living Grant (WILG). In November 2016 the Welsh Government (following in the footsteps of the English Government) announced the closure of the WILG. contentious and has left many recipients anxious and fearful that their right to Independent Living will be eroded by this decision. 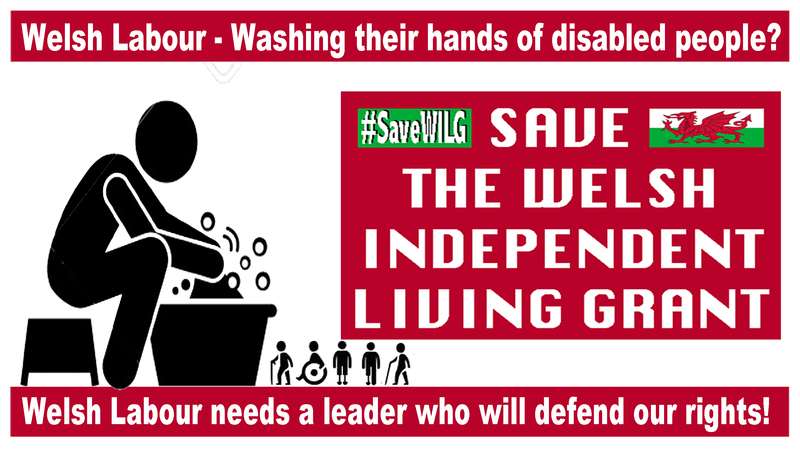 A strident campaign has been launched by recipients of the WILG (and the previous Independent Living Fund (ILF)) and their families and supporters under the campaign banner of #SWILG. disabled people experienced considerable losses as a result of the 1988 changes. transitional period so as to eventually provide support through nIn November 2016, it was announced that the WILG would close in March 2019 and that all recipients would be assessed by their Local Authority for care and support under the Social Services and Well-being (Wales) Act (SSWBA) 2014 by March 2018. The March deadline was extended to–September 2018 to enable local authorities to complete their assessments of WILG recipients. The analysis and studies of the impact of the closure on ILF in England are bound to give concern to WILG recipients in Wales. The Shakespeare and Porter 2016 study, which focused on the impact of the transition from ILF to local authority support, found high levels of concern and anxiety about Local Authority processes and provision during this period. The Department of Work and Pensions Post-Closure Review,found both positive and negative experiences of the transition. Those who had retained their provision or had an increase in provision or a slight reduction reported satisfaction without any loss to their independence. For those who had experienced a significant reduction there was a loss of independence, greater restrictions to their independence and an increased reliance on unpaid carers. There was also a concomitant impact on the emotional and physical health of these participants. Many disabled people who will be transiting from the WILG will be legally eligible for NHS CHC funding or at least NHS joint funding. In addition to the well-documented procedural hurdles they encounter in obtaining this support, in Wales a more troubling challenge exists. The Welsh Government has made it clear that it will not permit direct payments to be made for people eligible for NHS CHC (unlike in England such payments can be made. Many LHBs appear reluctant to facilitate direct payments via a trust arrangement (often referred to as an Independent User Trust (IUT)) even though the High Court has held this to be lawful (indeed necessary in certain situations). Anecdotally it is also reported that LHBs are placing obstacles in direct payments being made where there is a joint funding arrangement even though the Framework guidance makes it clear that where ‘an individual has existing Direct Payment arrangements, these should continue wherever and for as long as possible within a tailored joint package of care’. R (JF) v. Merton LBC highlighted the requirement for an assessment to have regard to the dimensions of well-being set out in stature.